1. Is earth at the center of the universe? It is popular today to deny any special recognition for the earth. Secular scientists tell us that we live on a speck of dust, circling a humdrum star in a far corner of an obscure galaxy! While this is all true, the earth remains of central importance. Scripture gives a refreshing contrast to secular thinking by declaring that earth and mankind are not an insignificant result of accidental evolution. The Book of Genesis states that our planet was created three days before the sun, moon, and stars. The purposes of the stars relate directly to the earth: to provide a calendar system (Gen. 1:14) and to declare God's glory to men (Ps. 19:1). The earth is also a universal reference point in that Christ came here to walk among men, and will one day return. An unseen spiritual battle goes on for the souls of men , focusing on this earth and extending to high places (Eph. 6:12). The earth is truly a spiritual center of the universe. It was once thought that the earth was physically located at the exact center of the universe, and furthermore that it did not move. This "geocentric" view is still held today by a few people, although Scripture does not require it and observation clearly shows the earth's movement. The earth revolves around the sun once a year. It also rotates on its axis every 24 hours. These motions add together in a dizzy combination. The earth's spin results in a surface speed of 1,000 miles per hour at the equator. The speed of the earth due to orbital motion around the sun is 66 times greater still. This is 30 times faster than a rifle bullet. During an average human's lifetime (70 trips around the sun), 41 billion miles are traveled. While you read this page, the earth has already traveled more than 1,000 miles! Fortunately, we do not directly notice this motion since the earth's faithful gravity force ensures that both its atmosphere and inhabitants remain firmly in place. However, earth's motion is clearly shown by the westward movement of the sun, moon, and stars through the sky (see table 1). We really don't know where the physical center of the universe is. If God's heavens are infinite in extent, then no center actually exists. But the question of the earth's physical position is less important than the spiritual reality of God's love for his people. 6. Did Bible Writers believe the earth was flat? No—this false idea is not taught in Scripture! In the Old Testament, Job 26:7 explains that the earth is suspended in space—the obvious comparison being with the spherical sun and moon. By 150 B.C., the Greek astronomer Eratosthenes had already measured the 25,000-mile circumference of the earth. The round shape of our planet was a conclusion easily drawn by watching ships disappear over the horizon and also by observing eclipse shadows, and we can assume that such information was well known to New Testament writers. Earth's spherical shape was, of course, also understood by Christopher Columbus. Some people may have thought the earth was flat, but certainly not the great explorers. Some Bible critics have claimed that Revelation 7:1 assumes a flat earth since the verse refers to angels standing at the "four corners" of the earth. Actually, the reference is to the cardinal directions: north, south, east, and west. Similar terminology is often used today when we speak of the sun's rising and setting, even though the earth, not the sun, is doing the moving. Bible writers used the "language of appearance," just as people always have. Without it, the intended message would be awkward at best and probably not understood clearly. When the Bible touches on scientific subjects, it is entirely accurate. 11. Have scientists discovered the moon’s origin? Scientists have devised four major theories for the moon's beginning. The fission theory states that the moon split off from the spinning earth, like mud flung from a bicycle wheel. Some say that the Pacific Ocean basin is the scar that remains from this loss of material. There are four basic problems with this theory. First, today's earth and moon do not have nearly enough circular motion for fission to have ever occurred. Second, although a moon split off from the earth would be expected to orbit directly above the equator, in actuality the moon's orbit is always tilted between 18 to 28 degrees to the earth's equator. (This is the reason why the moon appears higher or lower in the sky during different seasons.) Third, while the moon was moving outward from the earth, gravity would have pulverized it into Saturn type rings. Fourth, moon rocks are somewhat different from the equivalent material on earth. According to the capture theory, gravity brought the moon into earth orbit when it once wandered too close to earth. The main problem with this theory is the low probability that two space objects would pass each other so closely. Another problem involves the actual "capture" mechanism: it simply wouldn't happen! Instead, the moon would continue on its journey. We have often sent space probe "fly-bys" to other planets and they are not captured, but instead are thrown outward with great speed, as in a crack-the-whip game. Finally, capture doesn't really qualify as an origin theory since it assumes the moon's prior existence. The third theory has several names: condensation, nebular contraction, or accretion. It proposes the concurrent formation of both the earth and moon from small chunks of material. As a result, the moon "just happens" to circle the earth. The main assumption here is that the material would actually fall together into a big lump. Force calculations rule out such a collapse unless the cloud of material is already quite dense. Present-day dust clouds observed in space are nowhere near this dense. The fourth lunar-origin theory calls for a collision between the early earth and another planetary object, an impact causing an orbiting cloud of debris that eventually grouped itself into the moon. Some critics of this theory believe that such a giant impact would totally melt the earth's crust. Others question the probability of another object's hitting the earth with the precise speed and direction needed to result in the formation of a moon. The main reason for promoting this idea is that none of the other lunar-origin theories works! It was hoped by many experts that the Apollo program's manned visits to the moon would provide definitive answers to the lunar-origin question. Instead, many new questions were raised, and the origin of the moon remains a mystery to secular science. One common idea in each of the four "natural" theories is that the moon formed by relatively slow random processes. Scripture is in direct contrast to such reasoning-the moon was created suddenly (Ps. 33:6), from nothing (Heb. 11:3). 29. Did a comet kill the dinosaurs? The world's climate became either too dry or too wet. Earth 's magnetic field reversed, and incoming radiation killed most life. There is a lack of supporting evidence for any of these events! Instead, creationists suggest that most dinosaurs died as a result of the great flood described in Genesis 6-8. Dinosaur types which were preserved on the ark probably faced severe climate changes following the flood. Creation research continues to demonstrate the importance of the worldwide flood in explaining earth's history. 36. Have computers discovered the biblical ‘long days’? The report that computers have discovered the biblical 'long days' continues to be told but is unfounded. It is challenged here because false ideas should never be used to "support" Scripture. Furthermore, the computer story appears to raise modern science to a level of certainty that it does not possess. As printed in tracts and magazines, the story describes a problem that scientists faced in the space program. Apparently a missing day turned up in the computer positions for the sun and moon over the past centuries. These celestial bodies were not quite where they belonged! The key to the problem was then found in the Old Testament. Mathematical corrections seemed to be needed for the "long days" of Joshua and Hezekiah (Josh. 10:13, 2 Kings 20:11). These events, when inserted into the computer, made everything turn out exactly right. Although this apparent verification of Scripture makes a very interesting story, computers are not this smart! The only way to determine a change in the sun's or moon's location is to know their exact positions prior to the change, but there is no such reference point available. We do not know exactly where the created sun and moon were first placed in the sky. Even eclipse records do not prove useful in solving the problem. Can we not conclude that the long day of Joshua occurred exactly as described? And also that the backward motion of the sun in Hezekiah's time was a literal sign of God's power? Computers are neither needed nor able to prove these Old Testament events scientifically. 45. What was the Star of Bethlehem? Some of what astronomers describe as "stellar evolution" does take place. However, the process is misnamed, and parts of it are questionable. According to this theory, the life of a star is said to begin with the collapse of a gas cloud-a doubtful beginning, as explained in Question 56 (not currently online—see book). Bypassing this fundamental origin problem, a young star is said to begin in the "main sequence" category (see Question 98 in the book). These are average stars with a stable light output. The great majority of stars are in the main sequence, including our sun. When a star's hydrogen fuel runs low, it becomes a red giant or super-giant star. Such a star has expanded hundreds of times in size and has become somewhat cooler. Red giants include Betelgeuse and Aldebaran. Next, the star may either explode as a supernova or may slowly collapse into a small, hot white dwarf star. The companion star circling Sirius is such a dwarf (see Question 43 in the book). Such stars are said to be very old. Notice that the entire life of a star is an aging process: main sequence-red giant-white dwarf. Instead of stellar evolution, it might better be called stellar decay, degradation, or degeneration. Computer studies conclude that each stage of a star lasts for millions or billions of years (depending on the star's mass), but-in the recent-creation view-there has not been enough time for such change. And some observed star changes appear to be much more rapid than computer models suggest! For example, there is evidence that the dwarf companion of Sirius formed from a red giant in just 1,000 years. Other stars have also shown unexpected color changes, indicating that the aging process of some stars may be much more rapid than generally believed. Most stars have probably not changed substantially in appearance since the creation described in Genesis. The sun has certainly remained as a faithful "main sequence" star from the beginning. Since all the stars were made on the fourth day (Gen. 1:16-19), they are all actually the same age. From the beginning they have differed from each other in color and brightness-"in splendor" (1 Cor. 15:41). 65. Was there a Big Bang? Visit our Q&A page on Astronomy! The Big Bang is usually defined as a random, chance event. As noted in the previous question, some instability supposedly developed in an original "kernel" of mass energy, and the universe ballooned outward. However, Scripture clearly rules out such an accidental origin. A modified version of the Big Bang theory says that when the explosive event happened, it was directed by God. This is the theistic-evolution approach, an attempt to compromise the Bible with evolutionary theories, and it, too, must be rejected because of its many conflicts with the order of events in Genesis. Table 6 contrasts some of the chronological discrepancies between the Bible's creation account and the Big Bang hypothesis. Creationists maintain that what really happened at the time of creation is that God spoke and the earth appeared— he commanded and the heavens stood firm (Ps. 33:9)! All the many stars appeared suddenly and supernaturally in space. Scripture does not imply an explosion, although the universe must have experienced a sudden "explosive" input of ordered energy. Perhaps some of the astronomical data that seems supportive of the Big Bang theory, such as redshift and background radiation, needs to be looked at instead as evidence of a rapid creation. One secular variation of the Big Bang theory refers to an "inflationary" Big Bang, the suggestion being that the universe developed and matured very quickly in its first moments. In this particular theory, secular science seems to have taken one step in the creationists' direction. Further developments should be of interest in this area of theory and research. Missing Origin. The Big Bang theory assumes an original concentration of energy. Where did this energy come from? Astronomers sometimes speak of origin from a "quantum mechanical fluctuation within a vacuum." However, an energy source is still needed. Actually, there is no secular origin theory, since every idea is based on preexisting matter or energy. Missing Fuse. What ignited the Big Bang? The mass concentration proposed in this theory would remain forever as a universal black hole. Gravity would prevent it from expanding outward. Missing Star Formation. No natural way has been found to explain the formation of planets, stars, and galaxies. An explosion should produce, at best, an outward spray of gas and radiation. This gas should continue expanding, not form intricate planets, stars, and entire galaxies. Missing Antimatter. Some versions of the Big Bang theory require an equal production of matter and antimatter. However, only small traces of antimatter (positrons, antiprotons) are found in space. Missing Time. Some experiments indicate that the universe may be young, on the order of 10,000 years old. If true, then there is not sufficient time for the consequences of the Big Bang to unfold. A short time span would not allow for the gradual evolution of the earth, heavens, and mankind. Missing Mass. Many scientists assume that the universe will eventually stop expanding and begin to collapse inward. Then it will again explode, and repeat its oscillating type of perpetual motion. This idea is an effort to avoid an origin and destiny for the universe. For oscillation to occur, the universe must have a certain density or distribution of mass. So far, measurements of the mass density are a hundred times smaller than expected. The universe does not appear to be oscillating. The necessary mass is "missing." Missing Life. In an evolving universe, life should have developed everywhere. Space should be filled with radio signals from intelligent life forms. Where is everybody? 66. How is red-shift explained? The red-shift of starlight is a decrease in the energy of the light. This energy decrease results in a lengthening of the wavelength of the light, measured with an instrument called a spectrometer. Red is the rainbow color with the longest wavelength, hence the name "red-shift." Stars do not actually become red in appearance since the wavelength change is usually slight. Almost every star and galaxy is found to be red-shifted. The following list summarizes some of the alternative explanations for the origin of this stellar red-shift. Stellar Motion. If a star moves outward from the earth, its light energy will be reduced and its wavelength stretched or red-shifted. Stars and entire galaxies show varying amounts of red-shift, therefore implying a variety of speeds for these objects. Police actually use this same effect with radar to measure the speed of cars. Stellar motion is often taken as evidence in support of the Big Bang theory. Stars are assumed to be speeding outward as a result of the explosion. This is not the only explanation of red-shift, however. Gravitation. As light leaves a star, the star's gravity may slightly lengthen the wavelength of the light. A gravitational red-shift could also result from starlight passing near a massive object in space, such as a galaxy. As the light escapes from a strong gravity field, it loses energy, similar to what happens to a person struggling to the top of a mountain. Second-Order Doppler Effect. A light source moving at right angles (tangentially) to an observer will always be red-shifted. This can be observed in the laboratory by using a high-speed turntable. A detector is placed in the center and a gamma radiation source is placed on the outside edge. The gamma energy is seen to decrease, or "red-shift," as the turntable speed increases. This is an intriguing explanation for stellar red-shift. When applied to stars, it implies that the universe may be in circular motion instead of radial expansion. Photon Interaction. It is possible that light waves exchange energy during their movement across space and lose some energy in the process. A loss of light energy is equivalent to a "reddening" of its light. A theoretical understanding of this proposed "tired light" process has not yet been developed. Any of these four explanations, alone or in combination, may be responsible for red-shift. We do not know enough about space to be certain of the source of stellar red-shift. Simple questions in science often have complicated answers, and light is an excellent example. Light has both particle-like properties and wave properties. That is, light sometimes behaves like invisible particles called photons. These photons can collide with other particles such as electrons, and be deflected like microscopic marbles. At the same time, light also displays wavelengths which can act similar to water waves or sound waves. Scientists accept this unusual dual nature of light without completely understanding it. We are familiar with visible light, of course. The sun produces the dramatic colors that brighten our day. Rainbows, blue skies, red sunsets all result from the separation of sunlight into its spectral colors. However, this visible light is only a small part of the total picture. The sun and other stars also emit many kinds of light that our eyes cannot see. You have heard of some of these forms of light: radio waves and microwaves, ultraviolet and infrared, x-rays and gamma rays. All of these strange varieties of light flood our sky continually. If we could see them, the heavens would appear to be bright with energy. Although this sounds dangerous, it should be noted that the microwaves from space are just a whisper, much weaker than those produced inside a microwave oven. Also, most of the ultraviolet and x-rays are safely absorbed by the earth's atmosphere. In recent years, instruments have been designed to detect and learn from these invisible kinds of light. For example, infrared telescopes show us many new details of stars and galaxies, and receivers for the radio waves are built in the form of huge dishes. There is obviously much more light in space than "meets the eye," and each variety of light, visible or invisible, has its own story to tell about the heavens. Light was part of the initial creation, the opposite of darkness (Gen. 1:3). God is called "light" (1 John 1:5) and "Father of the heavenly lights" (James 1:17). This is a fitting title because light is pure, beautiful, and beyond human understanding. Christians are expected to be part of this image, since we are told to let our light "shine before men" (Matt. 5:16). 79. Is there life in space? All efforts to detect life beyond earth have failed so far. The search began with the moon, where astronauts walked during six lunar landings from 1969 through 1972. After it was concluded that the moon was a sterile, lifeless place, the search moved to the other planets and their moons. Viking probes to Mars in 1976 performed experiments designed to detect life, including microscopic organisms, with negative results. Two unmanned Voyager craft whose destinations include Jupiter, Saturn, and Uranus—have taken thousands of pictures of the outer solar system. They reveal harsh, nonlivable conditions everywhere (see Question 23 in the book). Searches of deepest space have been carried out by radio telescopes, instruments that are able to beam messages of greeting toward any planets that might be circling distant stars. Radio telescopes also "listen" for any space messages that may be coming in earth's direction. During the past few decades, scientists have searched dozens of nearby stars for intelligible radio signals. The results are once again completely negative. At this point, it appears that life as we know it is unique to planet earth. This conclusion has been very upsetting to evolutionists, who believe that life began spontaneously on earth and that the same thing probably happened elsewhere in the universe. 90. Which is the best telescope to buy? This is a practical question! Many beginning stargazers become discouraged because they are using the wrong equipment. 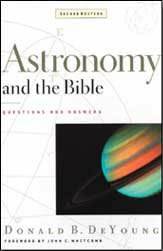 Just as there are different levels of reference books for the study of Scripture, so there are levels of optical tools for studying the heavens. In both cases, the best advice is to start simply and build upward from that point. One should make quality investments with lasting value. For the beginning astronomer, an initial aid might be binoculars, which should have wide-range optics and a power of about 7. (A label of 7 x 50 means that the magnification is 7, and the aperture or diameter of the front lens is 50 millimeters.) In many ways binoculars are superior to a small telescope. They are easy to use, give excellent views of the moon, planets , and star clusters, and they also work well for indirect viewing of solar eclipses and sunspots. Warning: The sun's image through binoculars should be projected onto a flat surface so it can be safely studied. After one is familiar with a binocular view of space, a refracting or reflecting telescope can be considered. Seek some informed advice and, if possible, try several out before making a purchase. The initial experiences will help the stargazer decide which telescope is best for his or her own interests. 93. What is the Anthropic Principle? This currently popular term in astronomy comes from the Greek word for man, anthropos. For any principle of science to be acceptable, there must be experimental results with general validity. The Anthropic Principle which states that the universe is especially suited for the well-being of mankind, is one such assumption. As just one of hundreds of examples, consider the tides that the moon causes on earth. If the moon was closer to the earth, tides would be greatly increased. Ocean waves could sweep across the continents. The seas themselves might heat to the boiling point from the resulting friction. On the other hand, a more distant moon would reduce the tides. Marine life would be endangered by the resulting preponderance of stagnant water! Mankind would also b e in trouble because the oxygen in the air we breathe is replenished by marine plants. We can conclude that the moon is in the "correct" position for man's well-being. Even such details as the mass of protons and the strength of gravity have values that give stability to the universe and thus reinforce the Anthropic Principle. (Additional examples are given in Question 94 in the book). The Anthropic Principle is a powerful argument that the universe was designed. Of course, whether it is an intricate watch or a beautiful planet, any design plan requires a designer! Evolution theory believes it has an answer to "design" in biological systems by hypothesizing ongoing processes of mutation and natural selection. Living things are said to change very slowly and improve with time. There are many fundamental problems with evolution theory, not the least of which is that-in the case of the Anthropic Principle-the theory provides no answer at all. Whether describing tides, proton mass, or the earth's position in the solar system, is not a grand design present from the very beginning? These phenomena don't mutate or change with time. The negative response of secular science to new evidence of design is interesting in that it shows the extremes to which man will go to maintain a belief in the random origin of all things. It has even been proposed that there really is an infinite number of universes, each with a completely different set of physical properties. According to such thinking, our particular universe just happens to have conditions suitable for human life, and that is why we are here to enjoy it! Of course, there is no way to detect any "other" universes or comprehend their underlying principles. Scripture describes the creation of just one universe. It contains all things, including the clear marks of the supremely intelligent design of our creator God.